No Sugar? In a Slurpee? It's coming to a 7-Eleven near you. Dallas-based 7-Eleven is introducing a new Slurpee Lite drink this summer featuring Fanta flavors with a sugar-free option. The company says this is the first time in the 45 year history of the Slurpee that they've made the brain freezing drink in a sugar-free version at the national level. Each drink will contain 20 calories per 8 ounces, according to a 7-Eleven press release, and will start flowing from Slurpee machines on May 23. 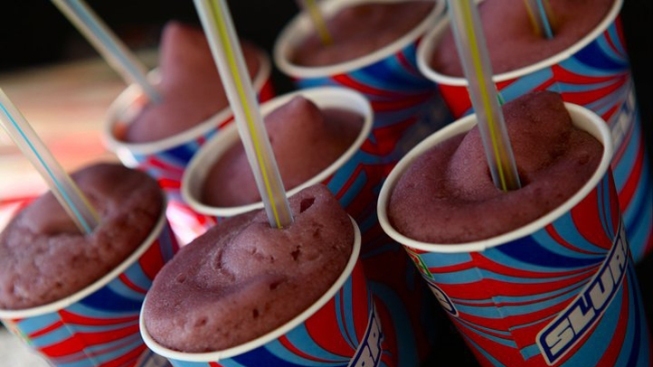 To help promote the new option, 7-Eleven will offer a free 7.11 ounce Slurpee on May 23 from 11 a.m. to 7 p.m. at participating stores -- pretty much adding another "free Slurpee day" to the calendar that we're assuming also includes July 11's traditional festivities.